Tag Archive | "gulf coast"
The highest risk for a direct landfall from Gustav lies from Houston, Texas, to Mobile, Ala. All interests along the Gulf Coast should monitor the progress of Gustav as that threat zone is not definite. The South Regional News story reports conditions will begin to deteriorate along the central Gulf Coast starting on Monday. Heavy rain, strong winds and pounding surf could batter the Gulf Coast for a prolonged period of time if a strong area of high pressure to the north slows Gustav’s forward speed around the time of landfall. 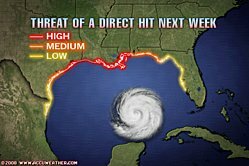 Federal, state and local officials are already taking precautions for those areas being threatened along the central Gulf Coast. The Associated Press reported the governors of Mississippi, Louisiana and Texas have each declared a state of emergency. Louisiana Governor Bobby Jindal also asked President Bush on Thursday to declare the state a disaster area. Louisiana activated 5,000 National Guardsmen Wednesday and Thursday. Jindal ordered 1,500 of those men and women to be sent to New Orleans today. New Orleans’ Mayor Ray Nagin stated that an evacuation order was likely for the city, but would not take place until Saturday. Jindal, however, declared residents south of New Orleans may be asked to evacuate as soon as today.